The whole point of devoting my early woodworking days to building stuff for woodworking is to learn. Today, while reading the latest issue of shop notes, I learned that the router table top, which I am building, is a laminated top. I guess I had always thought that laminated only applied to thin strips glued together. I don’t know why I assumed there was some sort of arbitrary thickness requirement. Now I know. The seven sets of laminated sections have become three. The middle section, which will become the portion which holds the router table plate, is twenty two inches in length. I decided that it would be prudent to test my flattening strategy on the shortest section, thus requiring less expenditure to replace, should things go horribly wrong. A while back I created a dado jig, which allows me to cut a dado using my router. Steve (and others) suggested that, since I don’t have a planer or a hand plane to do the job that I should use my router to shave off a uniform layer, and thus leave a flat surface. Of course, I would need to do some sanding afterwards, but it seemed like a good idea, and definitely worth a try. Because I get a thrill, every time I put to use, something which I have created, I used the legs for the router table, and clamped everything to them. I recently learned that it is best to insert the router bit all the way into the router and then lift it a small amount, before tightening it all the way down. My bit got stuck and Del at ACME tools in Cedar Rapids got my bit unstuck and fixed the collet. He didn’t even charge me. Del Rocks! Each time I go to ACME, he teaches me something new. So I carefully put my 3/8th inch up spiral Freud bit into my router and began routing. Each pass was flat and true initially. The jig allows me to make one pass to the right, then rotate the router, and make a pass back, thus removing 3/4th of an inch in total. The cuts on the backward pass seemed to be slightly deeper than they had been. I thought the bit might have slipped, but that was illogical. If it slipped, then both the cuts would be lower, not just the back pass. I looked at my setup more closely, like some sort of film noir detective. Upon closer examination, I realized the problem. The first pass was just in slightly from the edge of the boards, leaving a small swath that was the same thickness as the uncut portion. So with each pass the cut section grew and when the jig was no longer resting on the small raised section, the back pass guide was slipping down slightly. The minutia of the problem is not terribly interesting, but I felt good about catching it and solving the problem with a shim. It took a long time, but I successfully cut away a layer of unevenness and left in its wake a flat surface. So could I sand it, in such a way, as to maintain the flatness? I have a 3 inch belt sander, some 50, 80 and 120 grit belts. I reasoned that with even pressure and uniformly timed passes, the sander should remove wood at a constant rate. I was completely focused. I made sure I had a nice wide stance and applied very little downward force on the sander, letting it run across the wood. I tried to avoid much overlap, as that might cause a problem. A couple of passes with the belt sander and I went to a finer grain. I checked the flatness after the 80 grit and it was very close. So I put on the 120 grit and made one pass and then rechecked the flatness. I was especially careful, as I felt that I was on the verge of success and I didn’t mind moving slowly, if it yielded the results I wanted. When it was done, and I ran my hand across the flat smooth surface, I was ready to celebrate. But I decided I wanted to check one more time, with a different straight edge, just to verify. Sure enough it is flat! Now it is true, that I spent 3 hours doing what anyone with a planer would have done in 10 seconds, but that is ok. It was fun. This is the flattened portion at the bottom of the photo and the unflattened section at the top. I have a lot left to do. I need to flatten the other two sections. Then, I think I would like to flatten the bottom too, just so it looks nice, when I lift up the top. That is all for today. Now I think I need a larger bit, to make the task somewhat easier. What is the old expression? Life isn’t about the destination it is about the journey? It is said that out of all the emissaries that Kubla Khan sent out to the world, he favored Marco Polo the best because he was the only one that knew how to use his eyes. I love a nap. Meow. I have not tried it, but some time ago, I read here that if you use a 3/4” to 1-1/4” dish cutter bit, you won’t get the ridges from the sharp edges of the flat bottom bits. -- Doug, Bakersfield, CA - I measured twice, cut it twice, and it is still too short! I don’t have one of those bits, but I have been wanting to get one. Great idea!!! 2 points!!! Yea. You did it. I think this is a very cool process. What is neat about it is that it works for flattening tops that are too large for a planer. Also it does not care about grain orientation, as a planer does. You have just experienced a human powered CNC machine. It was a great suggestion. I am glad you mentioned the idea, or I wouldn’t have thought about it. It takes a bit of practice, but I do think I am getting the hang of it. 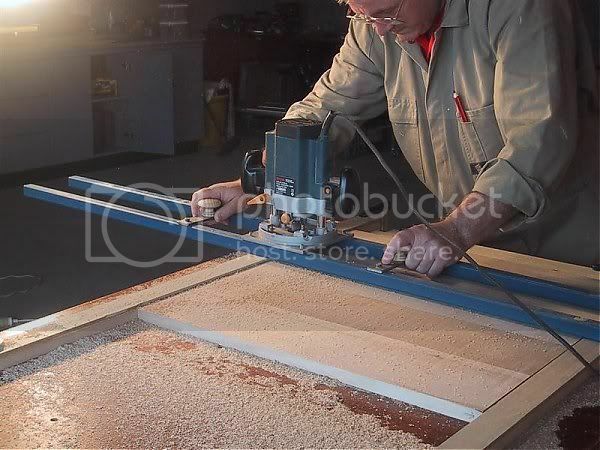 Brian, I have a jointer and a planer, but I am still going to make a planing jig for my router. It can handle wide boards as previously mentioned and also end grain like for cutting boards. Other things you can do with a properly made jig outfitted with a leveling system is to take the warp out of boards. You might in some cases be able to plane faster because you can take much deeper cuts with a router than with planer. 1/4” for example compared to 1/16” for a planer. 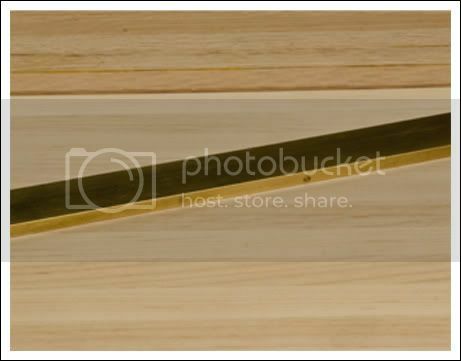 It is also great to do very thin stock like down to 1/32” if the workpiece is mounted on an mdf platter for instance. Wanna share the jig design or point us to it? The one I am current using is here…but be warned, I didn’t really write a design post, it is actually several posts, which talk about the jig, in the context of the Henry Wood Detective Agency story. If you follow the story for a couple of episodes, you will see the jig I am using now. Here is a link to a picture of the most simple of leveling jigs. I am only posting the link, so I don’t muck up your pretty pictures. It is not me in the picture, but someone that I don’t even know. He bolted two pieces of square channel to the bottom of his router, and then slides these over two reference boards. That is a really nice design, simple and effective. Thanks for sharing it with everyone.